One of our Innomatix data website features that is used a lot internally just got a revamp. This is our favorites feature for vehicles and DAPs. 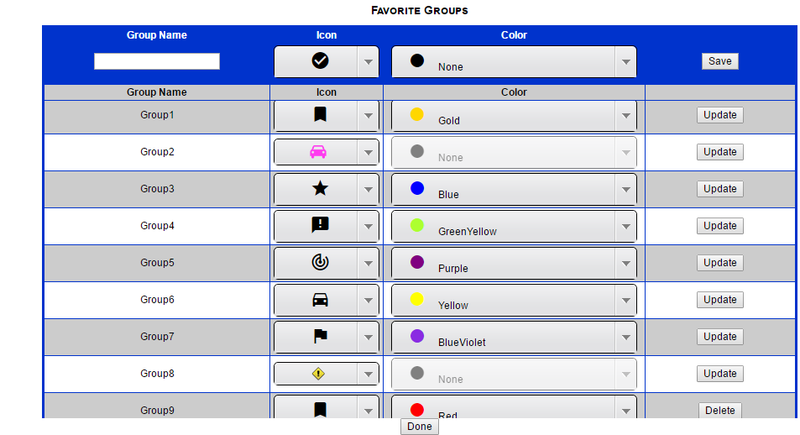 This feature allows the user to create groups and associate an icon with it. Then, each vehicle or DAP can be placed into multiple groups. You can access this feature from many pages on our website. You may have noticed this as the first column on the Readings page. The revamp includes the ability to add each vehicle or DAP to multiple groups, new icon choices, and a drop down box to sort by specific groups. This feature is not the most obvious, but it could be really useful to help some of our customers get organized. You are probably used to being able to sort your vehicles according to what fleet they are a part of, which is really useful, but what if the DAP you are looking for has moved fleets? Especially if you are a user that doesn’t have permissions to create fleets, this gives you control over how your vehicles and DAPs are grouped together. More importantly, vehicles are grouped by fleet, but DAPs can freely move across fleets. You could add all of your DAPs to a group called My DAPs. This is a group only you can see. Now, when you are trying to find a missing DAP, you can sort by that group. Then you will have a list of all the vehicles your DAPs were last in. Now you can find your missing DAP. If the vehicle it is located in has GPS data reporting, you may even be able to pinpoint its location. This could also be a good way to mark vehicles in certain stages. If you have some vehicles that are getting some reworking before you start testing again, you can add them to a group and remove them as you begin testing. This can be a simple way to keep track of all the things happening around you. To add groups, you can go to the top of the readings page and press the Favorites button. From here you can create your group name and choose the icon. Now just click on any favorite icon in the favorites column on the Readings page to add a vehicle or DAP to a group. These are a few ideas of how you could use our favorite’s functionality. Many of our users don’t even realize this feature exists, since it is not critical to use the website. Next time you are on the Innomatix data website; give the favorites feature a try.